tributary of the Jasachnaja, a second mass of 51kg was later found at a distance of 20 m from the first one, Met. Bull. 42, 43, Meteoritics, 1970, 5, p.97; see also, A.L.Graham et al., Cat. Met., 1985, p.323. The coordinates are of the town of Seymchan. Find circumstances, V.I.Tsvetkov, Meteoritika, 1969, 29, p.152. 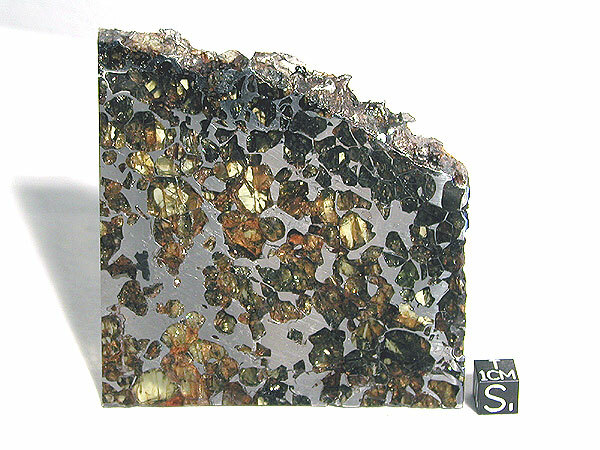 Illustrated description, with an analysis, 9.47% Ni, O.A.Kirova and M.I.Dyakonova, Meteoritika, 1972, 31, p.104. Further analysis, 9.15% Ni, 24.6 ppm Ga, 68.3 ppm Ge, 0.55 ppm Ir, E.R.D.Scott and J.T.Wasson, GCA, 1976, 40, p.103. Further INAA data, previously classified into the IIE group, but now designated ungrouped based on the chemical composition, J.T.Wasson and J.Wang, GCA, 1986, 50, p.725. Another analysis, A.N.Krot et al., Meteoritics, 1992, 27, p.465. Nitrogen isotopic composition, R.L.Palma et al., LPSC, 1997, 28, p.1057 (abs. ); see also, K.Marti et al., MAPS, 1997, 32, p.A84 (abs. ); K.J.Mathew et al., GCA, 2000, 64, p.545.